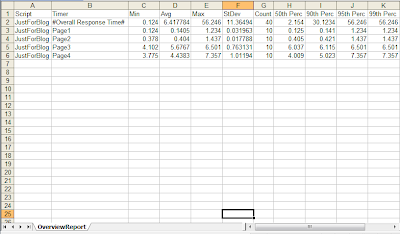 SilkPerformer reports percentiles in a different section than the main table and it can be time consuming, if you want to publish all the metrics in a single table. Therefore to solve this issue, a colleague (Murray Wardle) of mine wrote a visual basic script that generates a table with all the metrics. He has kindly allowed me to share it here and below is his description on how to use it. "Publishing results from SilkPerformer can sometimes be very time consuming. Most projects will have requirements involving the 90th or 95th percentiles and for some reason SilkPerformer reports percentiles in a different section of the report and not in the main table I wish to publish. Generally in my scripts I’ll use Timers for measuring response times (I’m not too keen of the automatic page and form timers) for timers controlled with the MeasureStart() and MeasureStop() functions, Inserting the following into the TInit will enable percentiles to be calculated for the Timers. Unfortunately percentiles are displayed in a different section of the report to the Min, Avg, Max, StdDev, Count, and it’s a waste of time trying to copy and paste the values into a spreadsheet. ScriptName, TimerName, Min, Avg, Max, StDev, Count, 50th Perc, 90th Perc, 95th Perc, 99th Perc"
NOTE: You are allowed to use the code as long as you acknowledge the author. 'The above copyright notice and this permission notice shall be included in all copies or substantial portions of the Software. 'THE SOFTWARE IS PROVIDED "AS IS", WITHOUT WARRANTY OF ANY KIND, EXPRESS OR IMPLIED, INCLUDING BUT NOT LIMITED TO THE WARRANTIES OF MERCHANTABILITY, FITNESS FOR A PARTICULAR PURPOSE AND NON INFRINGEMENT. IN NO EVENT SHALL THE AUTHORS OR COPYRIGHT HOLDERS BE LIABLE FOR ANY CLAIM, DAMAGES OR OTHER LIABILITY, WHETHER IN AN ACTION OF CONTRACT, TORT OR OTHERWISE, ARISING FROM, OUT OF OR IN CONNECTION WITH THE SOFTWARE OR THE USE OR OTHER DEALINGS IN THE SOFTWARE. 1: Save the above code as a visual basic script into a folder. Lets call this script as "ExtractOverviewReportData.vbs". 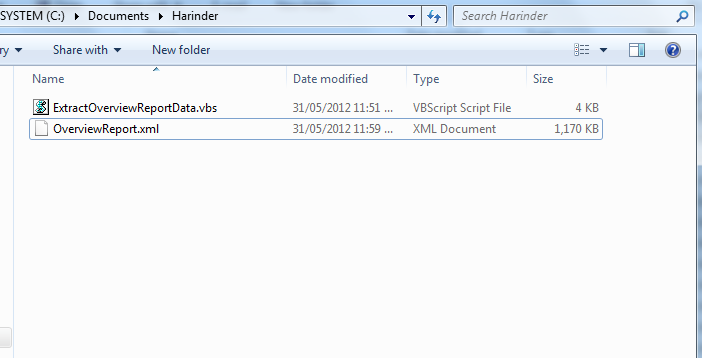 2: Navigate to you SilkPerformer project and copy OverviewReport.xml into the folder where you have saved vbs script. See the screenshot below. 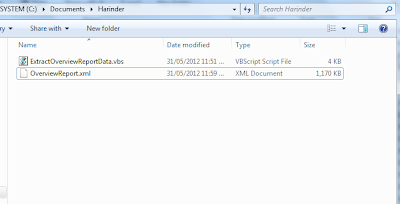 3:Now drag and drop the OverviewReport.xml file onto the script and it will create a csv file. Nice one , Thanks Harinder for Uploading it. Special thanks to Murray Wardle. 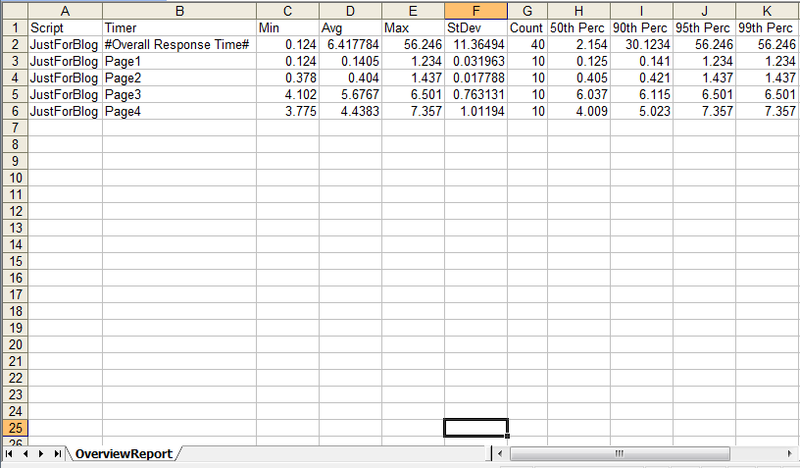 On trying this up, I'm getting an empty .csv file that only has the headers. What could be the probable cause and solution? Are you using custom timers? If not, you will require to change the vbscript. Is it possible to use a command line instead of drugging? Yes, nellietca. You can use command line instead of dragging. Use the command-based script host ("cscript"). Pass vbs file as the first parameter and Silkperformer xml as the second argument to it.